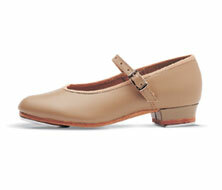 A leather upper, leather sole tap shoe with a 1/2"(19mm) heel. The taps are already in place and the buckle is attached by elastic for a firmer fit. Microcellular pads are included. Construction: Leather upper. Ladies sizes.